The Reaka family has resided in Wesley Chapel for 25+ years. Mike Reaka (President), established Wesley Chapel A/C company to be a local family owned business worthy of community trust. 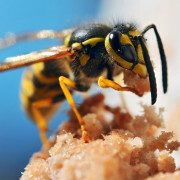 Wesley Chapel A/C provides repair service to keep your house cool on a budget. We also provide cleaning and tune up service to keep old systems running like new at peak efficiency and system replacements for ultimate efficiency and reliability with 10 year warranties on parts available. Service and replacement can be provided for any brand of equipment of any capacity. Although Mike’s Florida contractor license # CAC 1815518 qualifies Wesley Chapel A/C Company to provide all these services anywhere in Florida, our focus is on the Wesley Chapel, FL area. We don’t want any slaves, just customers! If you have an A/C problem you must call Mike at Wesley Chapel A/C. He’ll quickly diagnose your problem and have your cool air back on in no time. The wife and I lost our A/C today and thanks to Mike’s quick response we’re now relaxing in nice cool comfort. And, Mike operates with honesty and integrity and at very reasonable pricing. He won’t try and push a whole new A/C system on you. He knows that you likely only need a repair and that’s what he’ll find and fix. Unlike some of those big companies who push sales of new systems on you Mike will get you up and running again before those big guys can even get you an estimate. Call Mike at WESLEY CHAPEL A/C….You’ll be glad you did. Our air conditioning unit went out within three weeks of moving to our home. Mike was out and diagnosing the problem within 20 minutes and got us running cool and comfortable inside the house in less than an hour. I was completely amazed! Our 20-year-old heat pump was way past its prime and “living” on borrowed time. 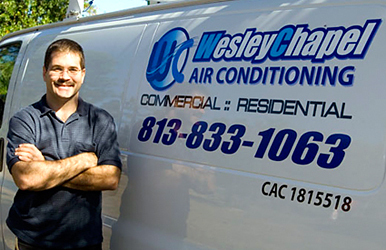 When it began to have trouble starting, I contacted Wesley Chapel Air Conditioning to see what they could do. The owner, Mike Reaka, came out to diagnose the problem. The immediate problem was with the compressor (the heart of the heat pump), but the entire system was old, inefficient, and in its last days. Mike does an excellent job. He is thorough, meticulous, and he makes repairs properly. Our A/C’s run more efficiently and they keep the house very cool. I highly recommend Wesley Chapel A/C. You won’t find anyone more honest. Absolutely top notch!! Prompt, professional and VERY fairly priced. Mike and the crew at Wesley Chapel A/C are awesome! Last night I came home to a house that was 87 degrees in the summer. They came out, even though it was late, and quickly got my AC up and running. I’ve used them several times before and Mike has always taken the time to explain everything to me, make suggestions, and does it right the first time. Mike did a great job re-configuring our air conditioner. It runs much more efficiently, is quieter, the house is less humid, and our electric bill went down by about $25 a month. We couldn’t be more pleased with his service.